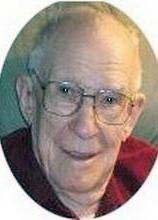 Port H. Beattie Sr. 92, of Waterloo died Saturday June 9, 2007, at Allen Memorial Hospital. He was born April 1, 1915 in Greene, son of Robert and Evea Trimble Beattie. He married Ruth A. Speck on August 31, 1940 in Waterloo. She died January 22, 2006. Mr. Beattie graduated from Greene High School in 1932. He was a veteran of WW II serving in the U.S. Army. He was employed as a mechanic with John Deere Waterloo Tractor Works for 33 years, retiring in 1974. He owned and operated Beatties Nursery and Landscaping in Waterloo for many years. He was also owner and overseer of Beatties Christmas Trees from 1932 until the present time. Survivors inlcude a son Port H. (Charlotte) Beattie Jr. of Waterloo; two daughters Paula K. Beattie and Carla M. (Tom) Leohr, both of Waterloo; six grandchildren: Jonathan Beattie, Lyndsey Beattie, Brandi (Chad) Freeberg, Jenni (Matt) Haan, Kerri (Nick Teisinger), Leohr Michael (Melissa) Beattie; eight great-grandchildren and one expected great grandchild; a nephew Ken (Linda) Showers; and a niece Vicki (Peter Mitchell) Showers. Preceded in death by his parents; a sister Zelma (Ivan) Showers; a grandson, and a great grandson. Services will be 1:00 p.m. Wednesday at Hagarty-Waychoff-Grarup Funeral Service on West Ridgeway with burial in Garden Of Memories Cemetery where full military rites will be conducted by Veteran Of Foreign Wars Post 1623 and American Legion Post 138. Public visitation will be from 5 to 8 p.m Tuesday and for an hour before services on Wednesday at the funeral home.